Vinyl shutters suitable for areas prone to damp or ‘splash’ areas. Perfect for bathrooms! As you can probably imagine, we’re utterly mad about shutters here at Shutterly Fabulous HQ – which is why we’re constantly looking for the latest technological improvements and variations to make it easier for you to get the Shutterly Fabulous look in more areas of your home. We’ve now developed our latest addition to the Shutterly Fabulous family – Vinyl Shutters. 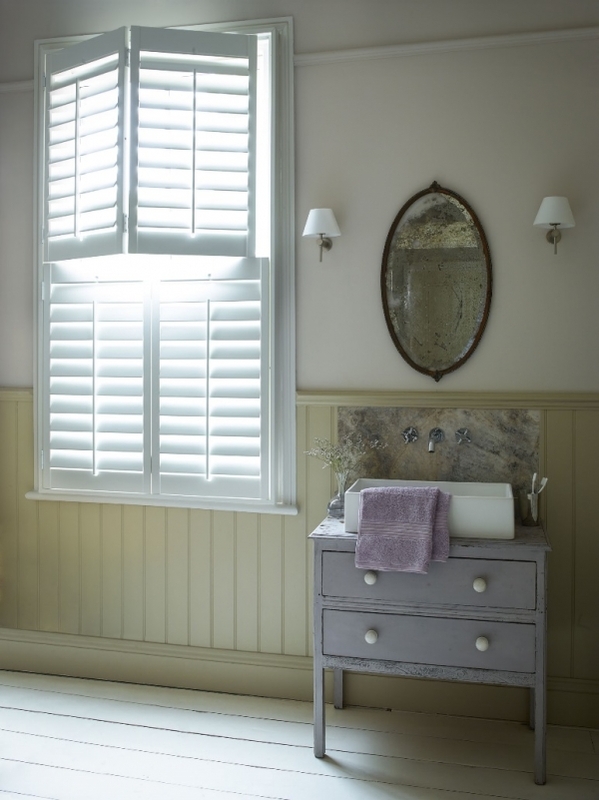 Combining function with form, the new range of vinyl shutters make the perfect addition to any high-moisture area of your home, such as a wet-room or bathroom area. Made from lightweight aluminium and coated in top quality vinyl, these shutters offer complete protection against water intrusion, meaning issues like warping and staining of shutters can become a thing of the past. You can now transform the look of these areas of the home. Traditionally, because of their ‘wet’ nature and the opportunity for damage, wet-rooms could be quite stark and uninspiring in terms of decorative finishes. Now, you can incorporate the shutter ‘look’ and make such spaces more inviting and aesthetically appealing. Available in three different shades of white and with tier-on-tier, café style and full-height style options, you can now make an elegant style statement in every room of your home.